The Asian American Arts Alliance (a4) is asking artists from across the five boroughs to explore their own personal meanings of the word with Locating the Sacred, a twelve-day, twenty-event festival to take place September 12 through 23. Using the central theme of “sacred,” a4 challenges artists to create programs that explore the term “sacred” beyond its traditional meanings. 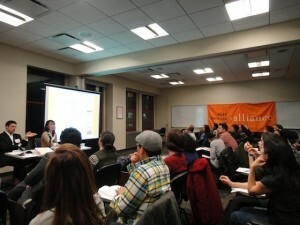 The Alliance began accepting applications on January 3. In addition to artists, venues that are interested in hosting events – dubbed “space hosts” by a4 – are asked to apply through a4’s website, aaartsalliance.org. The deadline for applications is Monday, February 20. Although this is a festival run by the Asian American Arts Alliance, an organization that serves the Asian American community in New York, artists aren’t required to be Asian to participate. However, the project being pitched must reflect an Asian or Asian American experience. A4 is in the process of assembling a panel of artists and arts organizers that will sift through the applications and determine what projects and venues best represent the theme. Placing the first round of successful artists in a pool by early March, the panel will also match projects to space hosts. All events should be scheduled by early July. The event is the first of its kind for a4. In addition to organizing the festival, a4 will produce the opening and closing ceremonies and a panel discussion series. The opening ceremony will explore the love of the divine and will most likely be a concert held in a church. By contrast, the close will look at personal love and involve a three-minute flash mob. The panel discussions will revolve around themes that relate to faith, activism, and the arts. Inspired by the World Festival of Sacred Music in LA, a4 Program Director Nico Daswani – who once served as Director of Festival Program for that festival – wanted to organize a citywide initiative to bring together New York’s Asian American artists, promoting collaborations. The festival is a microcosm of a4’s focus: To create a place for the Asian American community to gather artistically. To help with that collaborative process, a4 launched Festival Artist Café, an online resource where artists can connect and potentially form collaborations that could be included in Locating the Sacred. Artists of all kinds – painters, dancers, singers, actors, writers – are encouraged to participate. While a4 encourages new work, the organization recognizes the time and budget constraints, so previously published or performed pieces are acceptable. Depending on the scope of the project, a4 will underwrite artists’ projects up to $2,000 and will offer advice on how to raise more funding. Additional monies can be raised through grant applications, Kickstarter campaigns, and ticket sales. To impress the panel, Daswani suggests applicants be as clear and thoughtful about their projects. Don’t simply describe the project itself, but relate the scope of the planning, including additional funding and an idea for a space host, if appropriate. This will give the panel an idea of how you envision your project. Of course, a well-defined use of what “sacred” means to the artist is required. Locating the Sacred is a broad concept that’s sure to attract creative and thought-provoking projects. For more information on Locating the Sacred, visit aaartsalliance.org.